Biographies for children tend to err by romanticizing their subjects, setting them up as paragons, and perpetuating stereotypes, in the spirit of Longfellow’s stirring and bombastic lines: “Lives of great men all remind us/ We can make our lives sublime,/ And, departing, leave behind us/ Footprints on the sands of time.” But two recently published picture books, remarkable examples of the genre, eschew embarrassments of this sort. 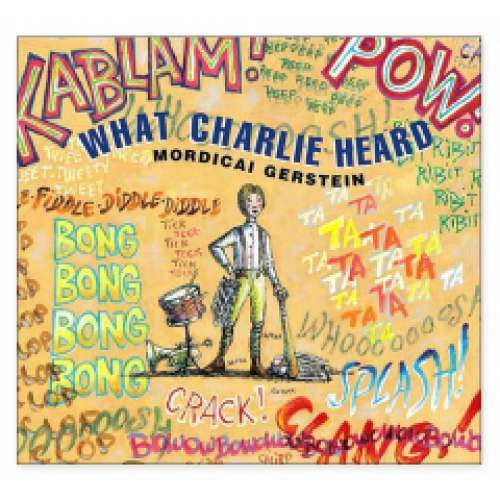 These books depict the American modernists Charles Ives and Gertrude Stein, not exactly conventional heroes for children, and expertly recount experiences drawn from their lives. Stein and Ives were born two years apart, in 1872 and 1874, in Allegheny, Pennsylvania and Danbury, Connecticut, respectively. They shared decades of neglect by an indifferent, uncomprehending public until, belatedly, their achievements were recognized. In 1933, with the publication of The Autobiography of Alice B. Toklas, Stein effectively became, in France and in the United States, Gertrude Stein, while much later, in 1947, a dispirited Ives received the Pulitzer Prize for his Third Symphony (“The Camp Meeting”) after a New York performance conducted by Lou Harrison. Gerstein and Winter, inspired by modernism’s spirit of formal experimentation, offer smart and frolicsome entrées into Stein’s and Ives’s worlds. With great brio, they demonstrate what it felt like, sounded like, and looked like to have been their unusual protagonists. Neither book pretends to tell the whole story. Sparked by bold color and cunning designs, they introduce today’s children to their quirky protagonist-artists from the inside out. Gerstein and Winter welcome children into creative contact with Ives and Stein. They elicit identification, laughter, and moments of genuine pathos. On the jacket of What Charlie Heard, a young Ives, drawn true to his photographs as a boy of about ten, stands before us in suspenders and knee britches. Casually, he holds the emblems of his two great loves, music and sports: a baseball bat in his left hand and several sheets of music in his right. The first instruments he learned to play, the drum and the trumpet, rest nearby within easy reach. His eyes have a faraway look. Clearly, he is listening. All around him, we can tell exactly what he is hearing: TA TA TA TA, BONG BONG, KABLAM, POW! CRACK! CLANG! SQUEAK, CRACK! SPLASH! CLOP CLOP, WHOOOOOOOSH… Painted letters in varied fonts and sizes, colored blue, red, yellow, white, some bordered, others not, spaced idiosyncratically and traveling every which way, crowd the space. Thronging and overlapping, they form a veritable dictionary of onomatopoeia. Focusing on Ives’s intimate relationship with his oddball bandmaster father George, a gifted cornet player and dedicated music teacher, who, as a boy himself, played for Union troops during the Civil War, Gerstein shows us just how George Ives becomes his son’s first mentor and lifelong inspiration. One day during a thunderstorm, as church bells ring, George dashes outdoors to listen. Dripping wet, he returns to the house and, sitting down at the piano, tries to replicate what he has just heard. The chords seem not quite right so he rushes back into the rain to repeat his experiment. Little Charlie watches, listens; then he too goes to the keyboard and tries to do the same. On another occasion, George Ives arranges for two bands to march through the streets of Danbury in opposite directions each playing a different tune. Charlie never forgets this: the experience finds its way years later into the second movement of his orchestral work, Three Places in New England. On a double page spread, George takes Charlie to a camp meeting at night under a tent, where ordinary people with untrained voices join together to sing hymns and create soaring impromptu music. Bursting forth on these pages are the apparently insignificant beginnings of what eventually become the hallmark of Ives’s musical composition—an enthralling mix of radical experimentation with an affectionate love for tradition. The birth of this style occurs importantly in the context of an intensely felt father-son collaboration. When, during Charles Ives’s freshman year at Yale, George Ives dies, a double page spread empties out before our eyes, and the bereft boy stands perfectly still in his pajamas next to an unhooked wall telephone, his hair unkempt from sleep, his arms hanging limp at his sides, painted in pale shadow. Slowly we read: “Charlie heard a great silence.” In the lexicon Gerstein has so luminously developed for us throughout the preceding pages, we understand that empty space means the absence of sound. Any child reaching this page cannot help but be sobered and moved, even to the verge of tears. The loss is as real as can be achieved in a representational medium. And when we see Ives many years hence, bearded and aged, still listening, fantasizing now in his dreamy abortive way about the Universal Symphony he will never write, we and the children both know beyond words that the loss of his father remains with him and will never be assuaged. Unlike Mordicai Gerstein, Jonah Winter does not attempt to recount the story of Gertrude Stein’s life. His mood is different. He makes an ingenious choice: he invites children to a tea party at 27 rue de Fleurus, Stein’s legendary art-filled apartment in the sixth arrondissement in Paris, just off the Jardin du Luxembourg. There, alongside her guests—including Picasso, Matisse, and Hemingway—children meet Gertrude and Alice B. Toklas, who are both sitting in chairs, staring. (“Not the chairs. Chairs never stare.”) Gently parodic prose spiced with homonym, clang association, irony, nonsense rhyme, digression, and zany rhetoric pull the child into this curious cosmos. Enchanted by Calef Brown’s paintings, with their muted hues reminiscent of Gris’s and Picasso’s cubism, the child even meets Basket, Gertrude’s snooty clipped poodle. Romping from page to page, the text forces the eyes as well as the mind to bounce like rubber balls. Reading this book aloud to a four-and-a-half year old and to several other children, I made the obvious discovery that children are high modernists. They revel in repetition. They delight in Winter’s quasi-parental autocratic admonitions: “But but but but wait a minute… heavens no…no no no no no… More talk. Laugh. Okay. Enough.” At the end of the party, a great disconnected arm (Alice’s, no doubt) reaches out with a long pink index finger and extends, pointing, across the entire page: “Okay time for you to leave… Leave. Go. Out, out, out.” You must leave because Miss Gertrude writes at night while Alice sleeps. Her hand-written words tumble magically across the page into Alice’s typewriter when, the next morning, while Gertrude is sleeping, Alice diligently transcribes them. Earlier, Picasso enters the party, his iconic straight hair falling over his left eye. He looks angry, says the text: “He just invented Modern art which is not the same as being angry but then again maybe it is. Maybe it is and maybe it isn’t. Then again maybe it is. It’s so hard to invent Modern art.” The four-year-old boy I know laughs uproariously at these lines—and his father now asks him routinely whether he is really angry or whether he has just invented Modern art! Ample Gertrude and slender Alice relate to one another in a complementary way; comfortable and unexceptional, their lesbianism simply a fact, unremarkable and unaccented. What matters supremely in both of these outstanding children’s books is that they enable children to grow aesthetically. And both books teach that significant human relationships have been indispensable to certain great artists and deeply implicated in their path-breaking works of art.